The DPG5600B is powered by 2 replaceable "AA" alkaline batteries that can operate the gauge for 150 to 1500 hours depending on backlight usage. All DPG5600 models include the 5 minute auto-shutoff circuitry standard to conserve battery life. A low battery indicator will be displayed when the batteries must be replaced. The gauge can be factory set for on/off operation by specifying the "-NS" option at time of order. Optional Units: Units such as Kpa, Bar, mBar, inH2O, mmHg, ftH2O, torr, kg/cm2 etc are available on special order. 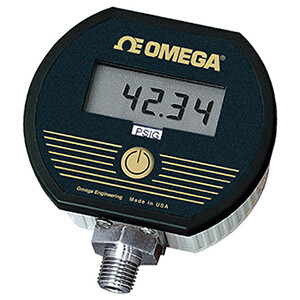 Please consult the Omega Pressure Engineering Department for available availability and pricing. 참고: To order with panel mount option add suffix "-PM" to Model No., add $50. Must be ordered with unit, can not be field installed at a later date.